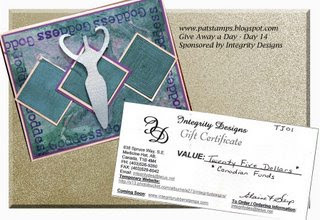 Today's TJNL giveaway is for a $25.00 (Canadian) gift certificate from Integrity Designs. To enter this giveaway, click HERE. One entry per person, per daily give away please, enter by 11:59pm EST on Monday, October 15.